CUTV is proud to be the award winning campus television station of California University of Pennsylvania and has been on the cutting-edge of college television for over 25 years. However, it is the students of CALU that really keep CUTV at the forefront of College TV: If you have any desire to work in television production, or just want to see what it’s all about, you’re in the right place! Check us out online and see what we do–then when you’re ready to get involved, come on down to the CUTV Studios in the first floor of the Natali Student Union. While many of our students are Communication Majors, we also have students from many different majors participating in-studio and on-location . All majors/concentrations are welcome! 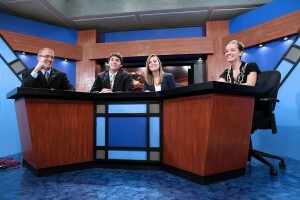 CUTV prepares students to work in the television industry. 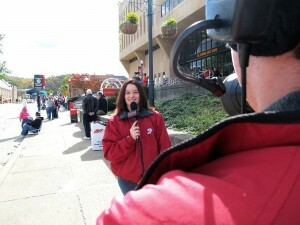 We have former crew members working with multiple television stations, professional and major league sports organizations, television-support companies, as well as regional and national sports networks. The anchors prepare News Center. In addition to the valuable experience CUTV Members gain on-the-job, students who go through the program together also make lifelong friends and build valuable networks in the industry. CUTV Students often participate in campus and in the community events together, as well. We are ALWAYS looking for new talent looking to further their college and professional careers in news, sports, or specialty programming. If you have any questions or are ready to get involved, let us know on our Facebook wall, drop us a Tweet @CUTV_PA OR contact smith_gm@calu.edu for more information! Welcome to the crew!